(AFP) - Sri Lanka's deposed prime minister in a tight grip on a key committee in parliament Friday, dealing with a blow to the country's president in the latest twist in a month-long political crisis. Sri Lanka has been politically paralyzed since October 26 when President Maithripala Sirisena sacked Ranil Wickremesinghe as first and replaced him with divisive trainer Mahinda Rajapakse. A vote on a Friday has been held in the absence of a legislative committee in the absence of a working government. 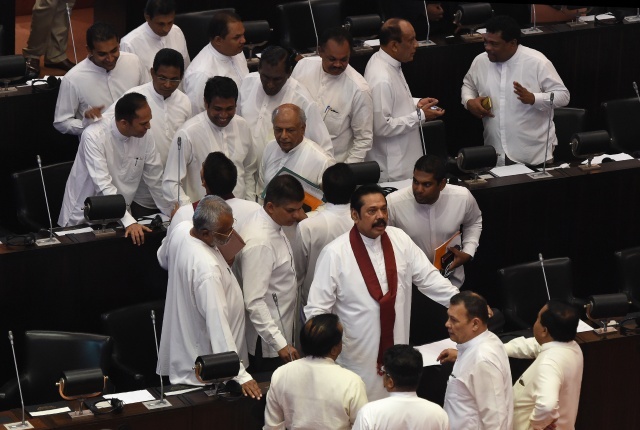 Shortly before Speaker Karu Jayasuriya took a vote on setting up the panel, legislators loyal to Sirisena and Rajapakse walked out of the chamber in protest. Rajapakse has lost two votes in the assembly, but refuses to step down. Wickremesinghe, despite being sacked a month ago, he is still in office and continues to occupy his official residence. Last week, chaos broke out in the assembly with Sirisena and Rajapakse loyalists attacking rivals with chilli powder and chairs to disrupt the second no-confidence motion against Rajapakse. Two weeks after sacking Wickremesinghe, Sirisena. However, these moves have been suspended by the Supreme Court. The legislature reconvened last week but degenerated into a punch-up. For 19 days, Sri Lanka had two claimants to the Prime Minister 's post - but since last Thursday. The crippling power struggle has a downgrade of Sri Lanka's credit rating. The authorities announced Thursday that they will be able to bear the brunt of the crisis. Legislators on both sides say that with the administration at a standstill, key sectors such as tourism in the Indian Ocean island.